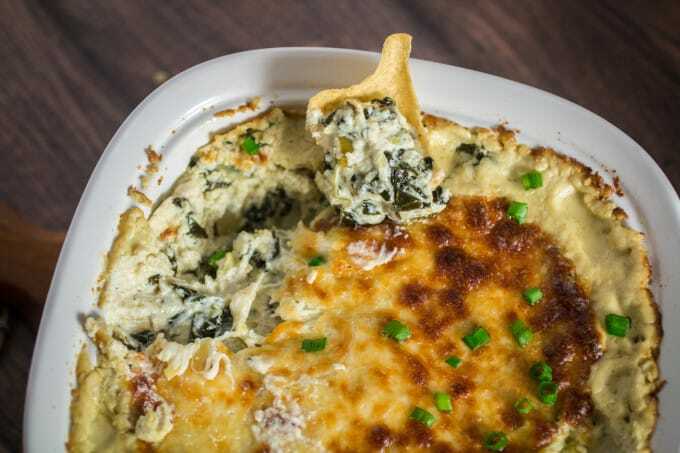 Cheesy, rich, and comfortingly creamy, it doesn’t get much better than this classic Spinach Artichoke Dip. 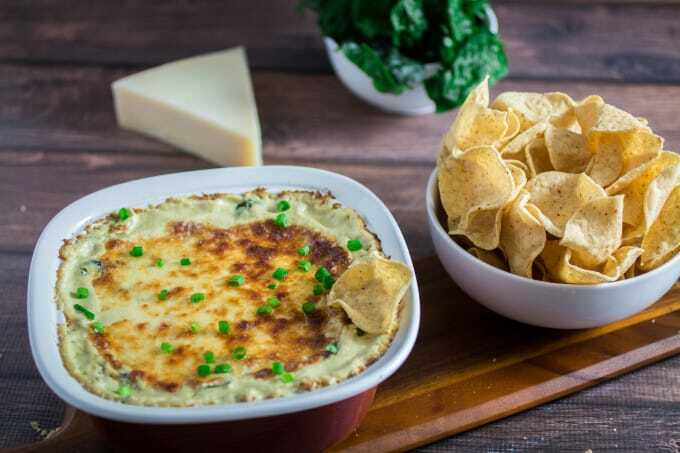 Topped with mozzarella cheese and baked to perfection, this dip recipe can be served with tortilla chips or a toasted baguette. You may want to make extra, this is one flavorful party food that won’t last long once it’s on the table! It’s creamy, it’s savory, and it even has a vegetable or two in it. That evens out the calories in the cheese, right? I like to think so. 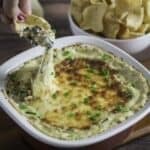 This dip is the perfect dish to bring to a party, board game night, or even for Sunday night football. Just get ready to make more, because your friends will definitely be asking for this one again. And again… and again… you get the idea. I’m so sorry for that one. Really, I am. I served a big ole’ dish of this at a game night a few weeks ago and received a resounding, “You NEED to make this for the blog!” from the group. So, here it is, in all its cheesy, artichokie-glory. You can add your own twist to this dish (I suggest jalapeño peppers, cheddar cheese or even lightening it up with Neuchâtel cheese), but I implore you to try this more traditional version first. This really is comfort food at its best. Millions of restaurant appetizer menus can’t be wrong, right? Oh, cheesy-goodness, I love you so, so much. Seriously, I could definitely eat this whole thing by myself. I’d have to pace myself, over the course of an afternoon, but I would enjoy every bite of it. Who really likes sharing, anyway? I don’t stand a chance when it comes to game day foods. You name it. Wings? Nope, no resistance. Chili? Even less of a chance. But spinach artichoke dip? Don’t even get me started. It’s the touchdown of game day foods. The blow-out win. The two-point conversion in addition to the touchdown. Ok, I’ll stop now. but you get the point. Cheesy, rich, and comfortingly creamy, it doesn't get much better than this classic Spinach Artichoke Dip. 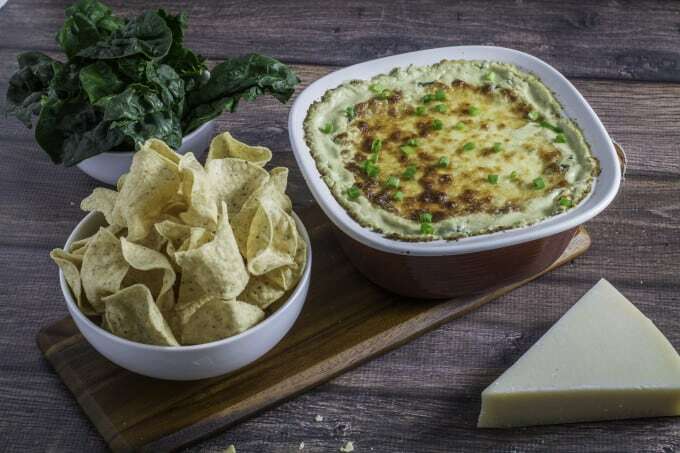 Topped with mozzarella cheese and baked to perfection, this dip recipe can be served with tortilla chips or a toasted baguette. You may want to make extra, this is one flavorful party food that won't last long once it's on the table! Preheat oven to 375°F. Grease a small baking dish and set aside. In a large skillet melt 2 tbsp butter. Add garlic and spinach and sauté until spinach is wilted. Remove from skillet and set aside to cool. Add remaining butter, artichoke hearts and green onions. Sauté artichoke hearts and green onions for additional 2 minutes. Add cream cheese, sour cream, 1 cup mozzarella, parmesan, and pepper. Stir all ingredients together as the cheese melts. Roughly chop spinach (if it is too watery, press into a strainer to drain some of the water out). Stir spinach into melted cheese. Remove skillet from heat and add spinach artichoke dip to baking dish. Sprinkle remaining 1 cup mozzarella cheese on top. Bake uncovered for 15-20 minutes, or until cheese is golden brown and melted on top. Serve hot with tortilla chips, toasted baguette or crackers. Thanks! I’m definitely trying to become that person who always brings the amazing dip to parties. Pretty much everyone enjoys it, you rarely go home with extras, and it’s easier to make than say wings. lol! 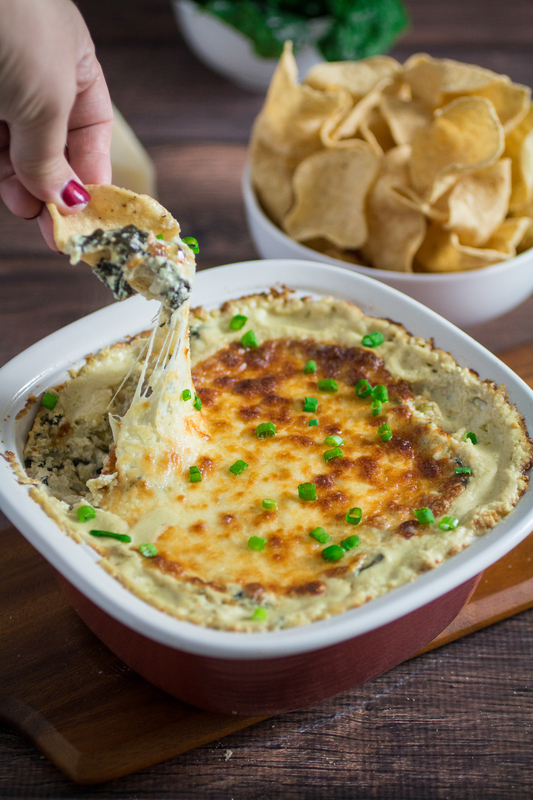 I LOVE spinach artichoke dip and the melted mozzarella on top is such a brilliant idea! The more cheese the better! Yum! I love spinach and cheese. They go perfectly. Best comfort food out there! Lovely photos! Thanks! I agree, spinach and cheese just belong together. Thanks! I definitely eat too many chips when this gets served lol. Thank you! Hey, now I want to know your recipe. Maybe we can mash them into each other and create the ULTIMATE SPINACH ARTICHOKE DIP! That looks seriously good! I’m trying to cut back the amount of dairy in my diet, but I wouldn’t stand a chance faced with that gorgeously cheesy dip. Yum! I feel your pain lol. I wonder how this would be with vegan cheese. Daiya is pretty good at being melty. Hmmm. Oh great – now you having me craving this! 😉 Looks fantastic. Thanks for sharing with us at the #HomeMattersParty link party. Ah, this looks divine, saving this one for later, it looks like a crowd pleaser! I’m so wishing that I had some of this dip to enjoy right now! I always get excited when I go to a party and someone brought a version of this dip. This recipe looks particularly awesome! I LOVE spinach and artichoke dip! And this one looks phenomenal! So totally perfect for fall football weekends 🙂 YUM!!! I have a recipe that’s very similar. There are never any leftovers. I love all your pictures, they make me hungry for spinach artichoke dip. Thank you so much! Spinach Artichoke Dip is definitely one of my favorites, there’s so many ways to make it. I’d love to try your recipe! I plan on making this for watching the Oscars. Can I use frozen spinach instead of fresh? And if I do, how much? Yes, chopped frozen spinach would be fine. I would defrost and let the spinach drain first, then use about a cup. Sorry for the late reply! Did you make this for the oscars after all? This is incredibly late, I did make it for the party! Funnily enough, I’m making it again for the Tony’s. 🙂 It’s delicious! Can u make u to the point of baking then bake the next day ? Yes, that should work fine. Just refrigerate in-between.